Yesterday, Lost at DVM socks were finished. I intended to post about them yesterday, too, but the opportunity to spend time with a friend was much more attractive. N's a knitter too, but we have more in common than just knitting. We both got some knitting done, too, as we spent time together, and then,I got more done last night. 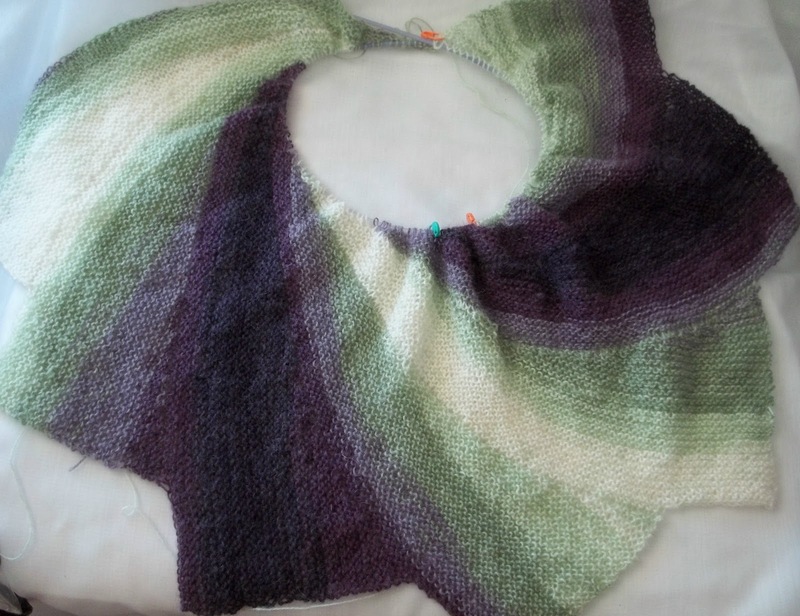 Now my Wingspan scarf has 7 wedges (and there is almost no yarn left). There is plenty to complete the final wedge which will balance out the colors—and likely a bit more. But not enough to even think about making it bigger. I'll see how it ends up—as written—with eight wedges. (and some 400 yards) If I like it enough--well there is plenty more yarn that would be suitable for another one. I don't think the final wedge will be perfectly cooperative and end just at the point of the color change. Likely I will need to cut the yarn and remove the last few yards of the green—Then I can start the edge with the purple. The skein ends at the darkest part of the purple. Since I am going to cut the yarn anyway, I will re-wind the left over yarn into a small center pull ball, making the outside into the inside, and start the edging strip with darkest part of the purple. I see no reason that it won't be done today. 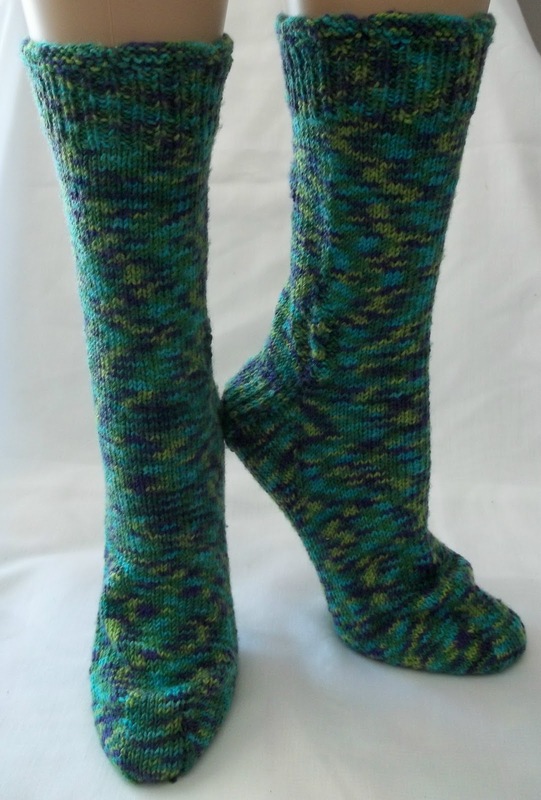 I did a bit of work on the other pair of socks, too, they still need inches (2) before the foot is done, and the toes. After that, I need to add the afterthought heels—so there is quite a bit of work to do. It won't be long till they are done, too. But as soon as finish the Wingspan, I will cast on for the swatch of lace to practice hand painting with. Then what? Well a slight break from knitting I think as I work on my dress, and other sewing projects. I need to take in some clothes (if I am going to keep them) and get rid of some clothes (if I decide they are not worth altering.) I gave N some silk blouses that just aren't worth altering. Silk tailored blouses are of the few things we share in our taste for clothes—but my bag of clothes for recycling will include some silk sweaters—in a style N doesn't like—so the wealth will be spread around.